BDO World Darts Champion Glen Durrant has officially opened a new pub in a care home in Middlesbrough. Glen, who was born in the town, was guest of honour at the ceremony Anchor’s Middlesbrough Grange in Fosdyke Green on Wednesday (4 April). Residents had been looking forward to having their own pub – the Netherfield Arms, which is the name of the original pub on the site of the care home. The room, which was originally a lounge area, has been decked out with beer pumps, a duke box and a dart board. District Manager Kathryn West said: “The residents here have lots of activities organised for them every day and we like to tailor them to needs and aspirations of our older people. “The residents were excited to hear that they would have a pub in the care home but they were amazed to hear Glenn Durrant was going to officially open it. “It will be a great meeting place for our residents to enjoy pub quizzes and other activities. Resident Pauline Watts, 75, who has lived at Anchor’s Middlesbrough Grange for more than three years, said it was great to have their own pub. Fellow resident Sandra Brown (pictured), who used to go to the pub three times a week when she was younger, said: “I like the pub because you can enjoy seeing your friends and getting together. Iris Pickard (pictured), 71, added that she liked everything about the pub. 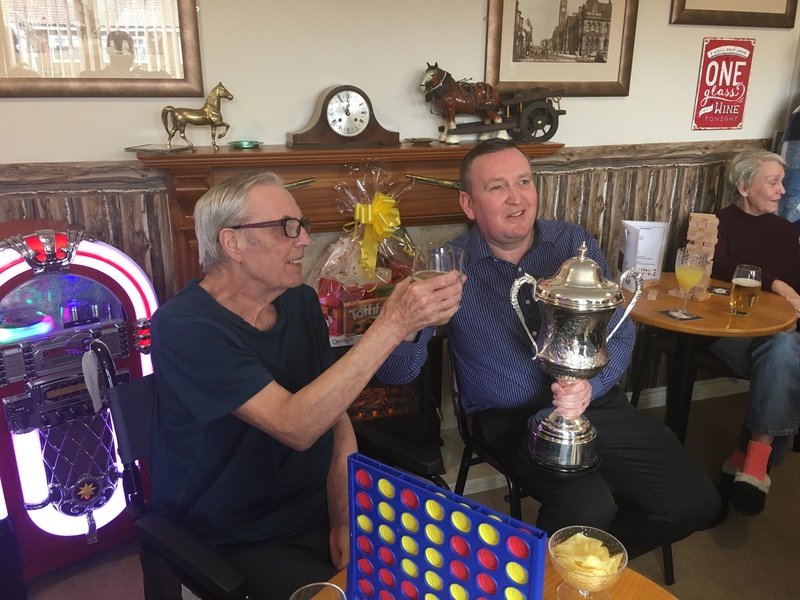 Darts champion Glen said he had never seen a pub in a care home but, having visited Anchor’s Middlesbrough Grange, he could see that it was a great place for the residents to socialise. He said: “I was so impressed by the staff. When I walked in, it was fantastic. There were smiles on the residents’ faces. It’s blown me away. It’s a great place to be. It was a special day. I’ll be walking away on a high. For more information on Anchor’s Middlesbrough Grange, contact 0800 731 2020. Previous ArticleBringing about real positive improvements in care provision is all about reducing administrative tasks.